Many aminoglycoside antibiotics that are being used as therapeutic agents are semisynthetic products. These compounds show excellent antibiotic properties, yet they suffer from ototoxicity and renal toxicity. Furthermore, bacterial resistance to aminoglycosides is widespread among pathogens, resulting in failure of these antibiotics in the treatment of infectious diseases. As a consequence, these antibiotics have been the targets of structure alteration to expand their spectrum of activity, to limit their susceptibility to resistance enzymes, and to reduce their undesirable toxic properties. Since, however, these compounds are multifunctional molecules, they present challenges in synthetic transformations, which have stimulated the development of chemistry special to them. The decade of 1970s witnessed a burst of activity in the development of synthetic methodology for aminoglycosides [1-4]. There has been renewed interest in these antibiotics because of the new properties that have been shown to be associated with aminoglycosides . Yet another reason is the recent availability of three-dimensional structures for the aminoglycoside resistance enzymes  and RNA binding sites for these drugs. To make this chapter a definitive review of the chemistry of aminoglycosides, we discuss only briefly the most important contributions from the earlier literature. The major coverage centers on findings from the early 1980s to the present. thetic compounds. These have been synthesized from their natural product parent precursors to increase their antibacterial activities and reduce the renal and otoves-tibular toxicity associated with these drugs . Many of these semisynthetic antibiotics (compounds 1-5 ), such as netilmicin 1 (1-jV-ethylsisomicin) , amikacin 2 [1-jV-(S)-4-amino-2-hydroxybutanoylkanamycin A] , and isepamicin 3 [1-jv-(s)-3-amino-2-hydroxypropanoylgentamicin B]  are aminoglycosides modified at position 1 of the 2-deoxystreptamine moiety, prepared by selective protection and modification of the amino groups of the antibiotics. These synthetic targets are challenging because aminoglycosides often bear four to six amino groups with comparable reactivities. To overcome this problem, methods have been developed to take advantage of specificity of the amino groups of amino-glycosides for regioselective chemical modification, due to their varying nucleo-philicity. In one method, regioselective modification can be achieved based on the differences in reactivities of the amino groups due to varying basicity or steric environment of these functional groups. The second and more important method, application of transition metal ions in temporary protection of some amino groups by complexation, leads to deactivation of the coordinated amino groups, leaving the others free for further chemical manipulation. Kawaguchi et al. 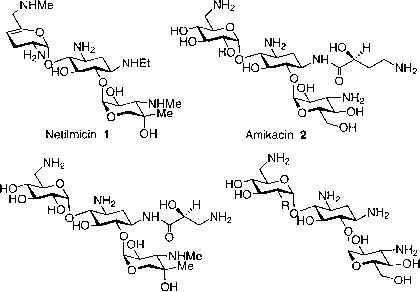 selectively modified aminoglycosides to prepare amikacin 2, a valuable and potent analog of kanamycin A, with activity against many strains of the Enterobacteriaceae and P. aeruginosa that show resistance to most other aminoglycoside antibiotics . The order of reactivity of the amino groups of kanamycin A (4), toward (ben-zyloxycarbonyloxy)-succinimide and other carbamoylating reagents is 6'-NH2 > 1-NH2 > 3-NH2 > 3"-NH2. Therefore, the amino group at position 6' was first protected by the reaction of benzyloxycarbonyloxy succinimide in low yield, and subsequently the (S)-4-amino-2-hydroxybutanoyl (ABH) group was introduced to the amino group at position 1 with poor selectivity. Removal of the Cbz group at position 6' furnished amikacin. The same order of reactivity has also been observed for kanamycin B (5), which possesses an extra amino group at position 2' with reactivity comparable to that of 6'-amino group (6'-NH2 > 2'-NH2 > 1-NH2 > 3-NH2 > 3"-NH2) . Therefore, the 1-N-ABH derivative of kanamycin B was prepared by selective protection of the 2'-and 6' -amino groups, and the resulting product was acylated by ABH to give the 1-N-ABH analog with poor selectivity . A similar sequence of reactions in the hands of several other investigators led in general to poor selectivity and formation of regioisomeric mixtures of products [13,14]. However, this method offers procedures that rely only on varying reactivities and basicities of the amino groups for selective protection, an approach that results in poor selectivity and does not seem to be a reliable means of regioselective modification of aminoglycoside antibiotics. Aminoglycoside antibiotics have long been known to make complexes with transition metal ions. It was discovered in 1966 that the addition of a solution of ammonia-containing copper(I or II) salts to these amino sugars can be useful for analytical purposes . In fact, addition of the ammonia solution of copper led to significant changes in optical rotation of the amino sugars bearing vicinal hydroxyl and amino groups . After this early finding, transition metal salts were found to be useful for synthetic purposes when Hanessian et al. took advantage of complexation of Cu(II) ion with the vicinal amino alcohol functions to selectively acylate the uncoordinated amino groups of kanamycin A via temporary chelation of the vicinal aminohydroxyl groups with Cu(II) ions. Soon after these initial results, the same chemistry was applied to other classes of aminoglycoside antibiotics, and a variety of other metal ions (Co2+, Ni2+, Cd2+, etc.) were employed as chelating agents for proximal (vicinal or nonvicinal) aminohydroxyl functions. For instance, sisomicin, gentamicins, and kanamycin A were selectively acyl-ated by various acylating agents in the presence of Co2+, Ni2+, or Cu2+ by Nagab-hushan et al. [17,18]. These workers demonstrated that Ni2+ and Co2+ temporarily mask the amino groups at 1- and 3"-positions, leaving the 3- and 6'-amino groups free for acylation. The data indicate that chelation of the vicinal (3" and 4"), as well as nonvicinal (1 and 2") aminohydroxyl groups, with these divalent ions led to protection of 1- and 3"-amino groups, allowing selective acylation of the uncoordinated sites. A similar strategy was used by Daniels and colleagues  to prepare 1-N-AHB analogs of gentamicin B (6), kanamycin A (4), and 3',4'-dideoxykanamycin B through their corresponding 3,6'-di- or 3,2',6'-tri-N-acyl-protected derivatives. These investigators were able to prepare isepamicin (3) in high yield (60%) via chelation of the 1- and 3"-amino groups of gentamicin B (6) with cobalt(II) acetate. Acylation of the 3- and 6'-amino functions in complex 7 followed by the decomplexation of the coordinated amino groups with hydrogen sulfide gave compound 8, which then was converted to 3 by selective introduction of the aminohydroxypropanoyl group at position 1, and deprotection of the protecting groups (compounds 6-8 ). Among the other divalent transition metals, Zn2+ ion proved to be a very efficient chelating agent for work on the preparative scale [20-22]. It was employed by Tsuchiya et al. to prepare amikacin (2) by a sequence of reactions involving temporary protection to the 1- and 3"-amino groups of kanamycin A (4) by zinc complexation and acylation of the free amines at the 3- and 6'-positions to form the Cbz-protected derivative 9, followed by selective trifluoroacetylation at the 3"-posi-tion to furnish 10 (compounds 9, 10). The selective acylation at the 3"-position was believed to be directed by the neighboring hydroxyl group participation. Finally treatment of 10 with an active ester of (S)-4-(benzyloxycarbonylamino)-2-hydroxy-butyric acid, followed by hydrogenolysis with palladium black, gave the product in high yield (>60%). The same procedure was also applied to prepare a 1-V-AHB derivative of kanamycin B .